Our Most Holy Lady, the Ever-Virgin Mary is a wonder and mystery which not even the angels can understand: “Heaven was astonished and the ends of the earth amazed, for God appeared bodily to mankind, and your bosom became broader than the heavens. Therefore, Mother of God, the leaders of the orders of angels and of men magnify you”, writes the poet of the Paraclitic Canon. She is, as Gregory the Theologian says, “God after God”. Of course, the Fathers also refer to her position elsewhere, clarifying it: “Let Mary be held in honour. Let the Father, Son and Holy Spirit be worshipped, but let no-one worship Mary” (Saint Epifanios). She was given the name Mary by her parents Ioakeim and Ann, but the name she mainly goes by in Orthodoxy is Mother of God. This term was ratified at the 3rd Ecumenical Synod of the Church in 431. But in order to express its great love and respect towards the Virgin, the Church has attributed to her a host of honorific titles and epithets. A typical example is Saint Nektarios, who devoted five thousand verses to her honour, comprising his “Theotokario” (also known as "Agne Parthene"). 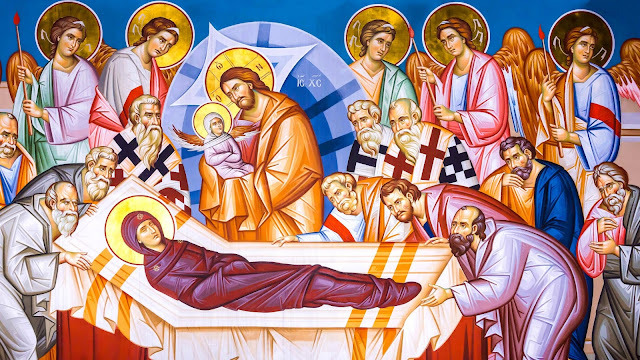 The day of the Dormition of the Mother of God is a high feast. In the life of the Church, the dismissal hymn and kontakion for the feast explain why: “In giving birth, Mother of God, you retained your virginity, and in your Dormition you did not abandon the world. You who are the Mother of Life have passed over into life and by your prayers you deliver our souls from death”. “Neither the tomb nor death had power over the Mother of God, who is always watchful in her prayers and in whose intercessions lies unfailing hope. For as the Mother of Life she has been transported into life by Him Who dwelt within her ever-virgin womb”.